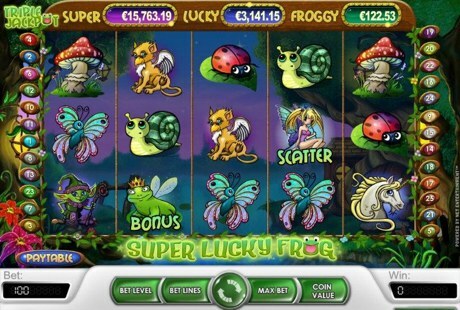 Super Lucky Frog is a 5 reel, 25 payline slot game featuring wild, scatter and bonus symbols, free spins, and 3 progressive jackpots. The Frog is the bonus symbol and triggers the jackpot game. The wild symbol substitutes for all your other symbols except for the scatter and bonus. The scatter is the Fairy symbol and it triggers free spins. 3 or more Fairies will award you with up to 30 free spins. During the free spins round your wins are tripled, except for the jackpot payout. This is a fairy tale in a modern package. And you don't even have to kiss the frog to win... just get 3 frogs or more on any of the 25 win-lines and you will reach the bonus wheel game. There you have a chance to win one of the three progressive jackpots: Super, Lucky and Froggy. You will spin the "wheel of jackpot" and if it lands on the "Super" sector the Super Jackpot is yours. There also 3 "Lucky" and 4 "Froggy" sectors on the wheel for you to hit. The largest ever hit Super Lucky Frog Super jackpot of £104,405.00 was hit by UK Player Kjell E. on August 22, 2013 at Betsson Casino. Every NetEnt casino has its own pools of the Super Lucky Frog slot jackpots, so visit the corresponding casino site to play for the highest grown jackpot(s).